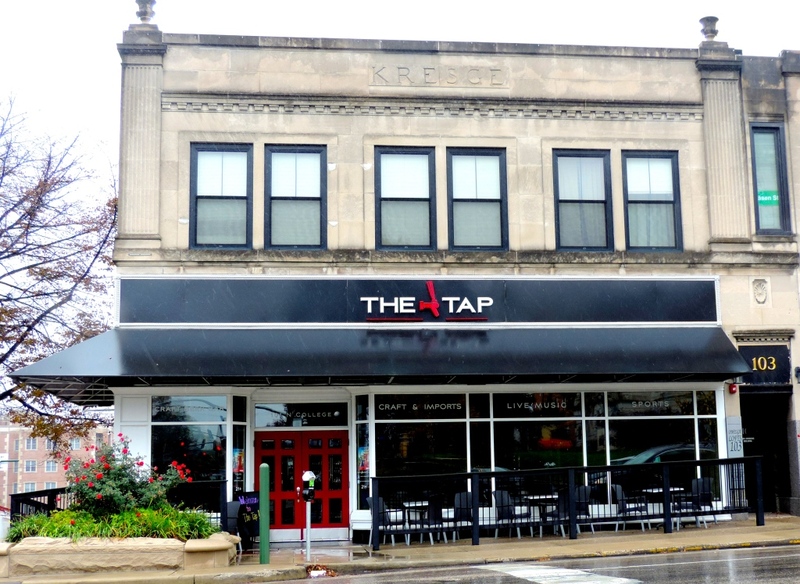 The Tap: Drinks, Live Music, and Great Food. What Else do you Need? Tap into one of Bloomington's best places for beer, food and live music. The Tap isn’t your typical college-town bar. The customer base is much less rowdy than the Kilroy’s chain of bars, but definitely not as hipster as Serendipity. If you like craft beer, sharing apps with friends, a nice glass of wine and live music, this place will be your new go-to. Stepping into The Tap we were greeted by a friendly bouncer at the door. After showing our IDs, he gave us pointers about where to sit, let us know when the music would start to play and how to order. Since it was pretty busy inside, we decided to sit outside in the small, buzzing patio area so that we could hear the music more clearly and enjoy B-town’s perfect fall weather. Our waitress came over quickly and told us about the list of over 450 beers, 50 of which are hand selected and served the best way – on tap. There is also an extensive wine list that supports local wineries, but I am definitely a beer person and barely heard a word after she said the words, “over 450 beers.” I have been to The Tap multiple times, and have gotten flights twice, which are four 4 oz glasses of beer. If you’re visiting The Tap for the first time I highly recommend getting flights because you can try four different types of beer instead of one. This is an easy way to compare different beers and get a feel for what type of beer you prefer. This time I got a beer called the Jack-O-Traveler, because ’tis the season, right? If you’re not a beer snob or a wine aficionado, definitely don’t hesitate to ask the wait staff for their advice or opinions about certain drinks. They are all very knowledgable, and can help you to narrow down your choice of 500+ drinks to find the perfect brew for you. To make your night even more complete, The Tap recently started serving food, and it’s amazing. I have been here multiple times, but this time I decided to try the garden pizza. And let me tell ya, it was one of the best non-traditional pizzas I’ve ever had. The mix of veggies was perfect, and it didn’t have an overwhelming “earthy” taste like other veggie pizzas I’ve had. Pro Tip: They are notorious for having delicious “Tap Fries” which come with four unique dipping sauces. A great app to share with friends or hog for yourself. So, now that you know about the drinks and food, it’s time to talk about the live music. I love that the “stage” is placed above the bar. It isn’t a big stage, but it is the perfect location to showcase the performer. Music plays every Thursday, Friday and Saturday night. The performers are usually talented, local musicians that you will enjoy listening to while sipping a drink, eating food and hanging with your friends. To see the calendar of live music list click here.